Martin Brocklehurst’s instructions to me were to fill his visit with as many important and influential people as possible, who might help develop citizen science in Australia – so I did. The result has been an amazing journey with global and local insights into a multitude of citizen science initiatives and a hugely positive and energised response from people across the country. It’s a great time for citizen science! Martin Brocklehurst is one of the Founders of the European Citizen Science Association (ECSA), Chair of the ECSA Policy working group, instigator of the Global Mosquito Alert Consortium (GMAC) and has played a key part in the formation of the Citizen Science Global Partnership (CSGP). His illustrious career has included high level government appointments in the Environment Agency (England & Wales) and with major oil companies (BP & Chevron). 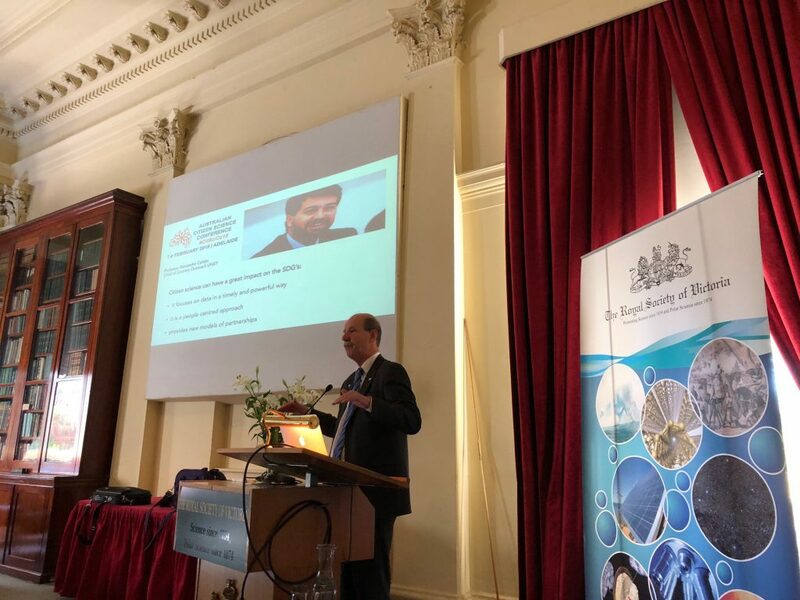 He is also a sought-after speaker and consultant internationally on the Circular Economy and was adviser to the UK House of Commons Environment Audit Committee enquiry “Growing the Circular Economy – Ending the throwaway society” July 2014. Martin’s three-week itinerary from Brisbane to Canberra, Melbourne and Sydney included public seminars and meetings with those already working with citizen science and those who can find value through citizen science in Australian policy making. He offered presentations targeted to his different audiences, describing the uptake of citizen science as a normal element of government agency strategy in both the USA and Europe. He described the latest challenge from the United Nations that citizen science has a very significant role to play in helping to achieve the Agenda 2030 through the 17 Sustainable Development Goals (SDGs). The citizen science community is young yet and finding its own way in the world through our Associations – with Europe, the USA, and Australia leading. But citizen science communities in other areas of the world are now emerging and the Citizen Science Global Partnership has been formed to act as an interface with global institutions. Martin spoke of the amazing advances of technology that are allowing us to think of citizen science projects on huge scales across nations and across the world. Good projects begun in one country suddenly being taken up in others without any promotion except through social media and word of mouth – unexpected results of open science and open technologies. He also talked about air quality citizen science in Antwerp (Curieuze Neuzen Vlaanderen)  where 10K passive diffusion tubes were made for participants to purchase and use in the survey, where 20K+ people wanted to take part and where pop concert events were used to share the results to communities. 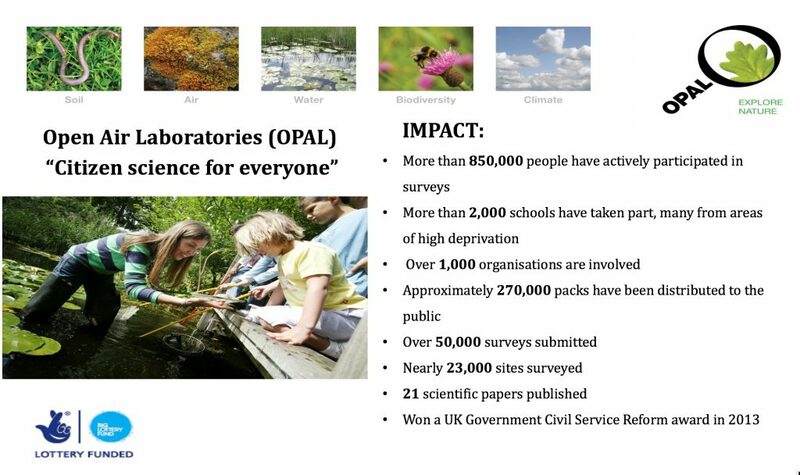 The UK OPAL Citizen Science for Everyone project, originally led by Dr Linda Davies is one of Martin’s inspirations, and it remains a beacon of good practice and large-scale engagement and impact today 10 years on. So many great stories Martin shared of the amazing power and potential of citizen science across the 17 SDGs. Yet a common theme emerged of agencies still seeing difficulties in using citizen science derived data in reporting progress towards the SDGs. For them it’s not “business as usual” and although the UN and organisations like the World Meteorological Organisation (WMO) are recognising that non-traditional data sources are essential if the SDGs are to be achieved, at present there is a credibility gap that needs to be addressed by citizen science. Citizen Science methods still remain to be incorporated into the recognised methods to gather data for reporting against the SDGs. Opportunities exist to support Tier 3 Indicators where “no internationally established methodology or standards are yet available for the indicator, but methodology/standards are being (or will be) developed or tested”. During our tour, we met experts from universities, the Mosquito Conference in Brisbane, Queensland University of Technology, CSIRO, Monash Sustainable Dev.Inst., Melbourne Water, Vic. Waterwatch, the Commissioner for Environmental Sustainability Vic., Geoscience Australia and the Australian Museum. And all admitted there are issues around data acceptability, whether real or imagined, but were all working to explore ways to work with community on meaningful research, whether around health, environment, water or pollution, and ensure data quality. We were very pleased to see that in Australia there are a number of organisations who are at the leading edge of best practice in their work and reporting, and who are all convinced of the power of citizen science to deliver data and strategic objectives. One of the keystone principles of citizen science is open data and usually open methodologies and Martin illuminated the possibilities of large-scale, global projects where data can be collected at a high level of granularity, yet also aggregated, analysed and presented in ways that will be acceptable to national government agencies and global organisations such as the UN and WMO. The SDGs are rapidly becoming a common overarching framework for sane development strategies worldwide and are being adopted by many organisations at all sorts of scales. Martin’s visit was brought to a wide audience through the good offices of the United Nations Association Australia (UNAA) and the Royal Society, who hosted the majority of the public events in Brisbane, Melbourne and Sydney. They are convinced of citizen science’s value and importance, particularly towards the SDGs which are their main focus. The mixed audiences at these events – which included members from both the Queensland ACSA Chapter and the Victorian ACSA Chapter – were very receptive to what were evidently new ideas and examples and possibilities, and the post seminar discussions were lively and constructive. The UNAA sees a partnership with ACSA as being a mutually beneficial relationship for the future and have already suggested we might present to the Prime Minister and Cabinet Group through their auspices. We were also fortunate to have discussions with the Australian Government Office of the Chief Scientist and senior officials in the Australian Government Department of Industry, Innovation & Science, the Australian Bureau of Statistics and the Office of the Queensland Chief Scientist. Further positive meetings with the Australian Academy of Science, Inspiring Australia and the National Science and Technology Centre indicated that more people are recognising there is a bright future for citizen science in Australia. Suggestions have been made that ACSA should consider developing a decadal plan to accelerate citizen science in Australia, it is in a good position to support Australia’s “soft diplomacy” and that the timing is right for a government department’s community of practice to explore the role of citizen science in supporting the development and implementation of Government Policy in Australia. This reflected the feeling at a meeting organised by Stephanie von Gavel at CSIRO, where a number of different government agency representatives were able to discuss a range of issues around citizen science, policy and how Australia reports against the SDG indicators. The largest public event was organised by Stephanie at CSIRO where over 50 people attended and more joined the seminar by video link. The presentation is now available here. Our estimate is that Martin has met with or presented to over 250 people from more organisations than we can count, at both State and National level, at 21 meetings over the three weeks of his visit. This has been a unique opportunity to press the case for development of an institutional framework for citizen science within the policy development and implementation responsibilities of the Federal and State Governments of Australia. Martin was able to show case the route map used in the US – through the Executive Office of the President and the Crowd Sourcing and Citizen Science Act of 2016 . He also gave examples from the European Union where the work of the Knowledge Exchange Network established across the various Departments of the EU resulted in the adoption of recommendations contained in a paper “Citizen Science in EU Policies – Policy Brief 15th March 2018. Subsequent briefing papers are already impacting the allocation of EU Research Funds and the way EU Policies are being implemented by National Governments. The European Heads of the Environment Agencies now have an active working group on Citizen Science that is exploring how to put in place an EU wide Citizen Science Project to tackle air pollution in European Cities. This group and the Heads of Environmental Protection Authorities Australia and New Zealand (HEPA) clearly have common interests in how citizen science can support their work. The challenge now is to build on the interest and energy that exists and find Australian mechanisms to embed citizen science as a routine part of Government Policy development and implementation across Australia.